Ukrainian pilot cosmonaut 1987-2001. Call sign: Uran (Uranus). Status: Inactive; Active 1987-2001. Born: 1962-03-26. Spaceflights: 3 . Total time in space: 329.95 days. Birth Place: Elanetsky, Elanets, Nikolayev. PERSONAL DATA: Born March 26, 1962, in the village of Elanets, Nikolaev region, the USSR. Married to Gidzenko, Olga Vladimirovna, born in 1961. They have two sons: Sergei and Alexei. EDUCATION: Yuri Gidzenko graduated from the Higher Military Pilot School in Kharkov (Ukraine) in 1983 and from the Moscow State University of Geodesy and Mapping in 1994. AWARDS: Hero of the Russian Federation, Military Meritorious award, 4 service medals, Yu. A. Gagarin Diploma. EXPERIENCE: Upon graduation from the pilot school in 1983 Yuri Gidzenko served in the Air Force as a pilot and a senior pilot. December 1987 to June 1989 he attended basic space training as a test cosmonaut candidate. Since September 1989 he attended advanced training as a test cosmonaut candidate. Gidzenko is an instructor of general parachute training. He has logged a total of 145 parachute jumps. March to October 1994 he was training for a space flight as a back-up crew commander (17th Primary Expedition/ Euro-Mir-94 Program). November 1994 to August 1995 he attended training for a space flight aboard the Soyuz TM transport vehicle/Mir orbital complex as the Expedition 20 Primary crew commander (Euro-Mir-95 Program). Yuri Gidzenko served aboard Mir from September 3, 1995 to February 29, 1996, and logged 180 days in space. One of the crewmembers on this mission was ESA astronaut Thomas Reiter. In October 1996 Gidzenko received his assignment as the ISS 1 crewmember, and started training as the ISS pilot and the Soyuz transport vehicle commander. Yuri Gidzenko performed his 140-day long spaceflight aboard the Soyuz transport vehicle/ISS/Space Shuttle October 31, 2000 to March 21, 2001. Since August 2001 he trained as the Taxi-3 crew (ISS visiting crew) commander. He performed his 3rd space flight in April 25, 2002 – May 5, 2002 as the Taxi-3 crew commander onboard the Soyuz TM-34 vehicle with Roberto Vittori (ESA flight engineer, Italy) and Marc Shuttleworth (space flight participant, South Africa). Gidzenko logged an additional 9 days and 21 hours in space during this flight. 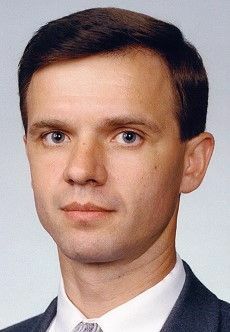 Since 2003 Gidzenko has been serving as a GCTC Department Chief. Born March 26, 1962 in the village Elanets, Elanetsky district, Nikolayev region. Resides in Star City. Married to Olga Vladimirovna (Shapovalova), born December 21, 1961. They have two sons. Gidzenko enjoys team sports, swimming, tennis and football. Gidzenko's parents, Pavel Vasilievich and Galina Mikhailovna, reside in the settlement of Berezovka, Odessa region. Graduated from Kharkov Military Aviation College of Pilots in 1983. Graduated from Moscow State University of land-surveying and cartography in 1994. Awarded three Armed Forces medals. After graduation from Aviation College in 1983, served as a pilot and senior pilot in the Air Force. 3rd class military pilot. December 1987 through June 1989, took the course of general space training. Starting September 1989 continued training in the group of test-cosmonauts. Instructor of paradrop training. Fulfilled 145 parachute jumps. From March through October 1994 trained for the 17th main mission and Euromir-94 flight as a commander of the backup crew. From September 3, 1995 through February 29, 1996, Gidzenko was the commander of the Euromir-95 mission on the Russian Space Station Mir. Gidzenko is presently in training as the Soyuz Commander for the International Space Station assembly mission 2R, along with fellow Russian Sergei Krikalev and NASA astronaut Bill Shepherd. Family: Cosmonaut. Country: Ukraine. Spacecraft: ISS, Mir. Flights: Soyuz TM-20, Soyuz TM-22, Soyuz TM-31, STS-102, STS-102 ISS EO-2, Soyuz TM-33 ISS EP-2, Soyuz TM-34 ISS EP-3. Agency: VVS. Bibliography: 12, 5432. 1962 March 26 - . Birth of Yuri Pavlovich Gidzenko - . Nation: Ukraine. Related Persons: Gidzenko. Ukrainian pilot cosmonaut 1987-2001. Call sign: Uran (Uranus). 3 spaceflights, 329.9 days in space. Flew to orbit on Soyuz TM-22 (1995), Soyuz TM-31, Soyuz TM-34..
1987 March 26 - . Soviet Air Force Cosmonaut Training Group 8 selected. - . Nation: Russia. Related Persons: Dezhurov, Gidzenko, Korzun, Malenchenko, Tsibliyev. 1995 September 3 - . 09:00 GMT - . Launch Site: Baikonur. Launch Complex: Baikonur LC1. LV Family: R-7. Launch Vehicle: Soyuz-U2. Soyuz TM-22 - . Call Sign: Uran (Uranus ). Crew: Avdeyev, Gidzenko, Reiter. Backup Crew: Duque, Kaleri, Korzun. Payload: Soyuz TM s/n 71. Mass: 7,150 kg (15,760 lb). Nation: Russia. Agency: MOM. Program: Mir. Class: Manned. Type: Manned spacecraft. Flight: Soyuz TM-22, STS-71 Mir EO-19. Spacecraft Bus: Soyuz. Spacecraft: Soyuz TM. Duration: 179.07 days. Decay Date: 1996-02-29 . USAF Sat Cat: 23665 . COSPAR: 1995-047A. Apogee: 398 km (247 mi). Perigee: 391 km (242 mi). Inclination: 51.70 deg. Period: 92.50 min. Mir Expedition EO-20. Crew commander was Yuriy Pavlovich Gidzenko of the Russian Air Force. Flight engineer was Sergey Vasilyevich Avdeev of RKK Energiya, and cosmonaut-researcher was Thomas Reiter of the European Space Agency. Soyuz TM-22 docked with Mir's front (-X) port at 10:29:54 GMT on September 5 and the hatch was opened at 11:01:23. 1995 December 8 - . 19:23 GMT - . EVA Mir EO-20-2 - . Crew: Avdeyev, Gidzenko. EVA Duration: 0.0201 days. Nation: Russia. Related Persons: Avdeyev, Gidzenko. Program: Mir. Class: Manned. Type: Manned space station. Flight: Soyuz TM-22. Spacecraft: Mir. Internal Vehicular Activity. Repositioned docking adapter..
1996 February 8 - . 14:03 GMT - . EVA Mir EO-20-3 - . Crew: Gidzenko, Reiter. EVA Duration: 0.13 days. Nation: Russia. Related Persons: Gidzenko, Reiter. Program: Mir. Class: Manned. Type: Manned space station. Flight: Soyuz TM-22. Spacecraft: Mir. Retrieved and installed material samples. 1996 February 29 - . Landing of Soyuz TM-22 - . Return Crew: Avdeyev, Gidzenko, Reiter. Nation: Russia. Related Persons: Avdeyev, Gidzenko, Reiter. Program: Mir. Flight: Soyuz TM-22, Soyuz TM-23. Soyuz TM-22 landed at 10:42 GMT. .
2000 March 23 - . ISS Status Report: ISS 00-12 - . Nation: USA. Related Persons: Gidzenko, Shepherd. Program: ISS. Flight: Soyuz TM-31. 2000 October 26 - . ISS Status Report: ISS 00-42 - . Nation: USA. Related Persons: Gidzenko, Shepherd. Program: ISS. Flight: Soyuz TM-31. 2000 October 31 - . ISS Status Report: ISS 00-43 - . Nation: USA. Related Persons: Gidzenko, Shepherd. Program: ISS. Flight: Soyuz TM-31. 2000 October 31 - . 07:52 GMT - . Launch Site: Baikonur. Launch Complex: Baikonur LC1. LV Family: R-7. Launch Vehicle: Soyuz-U-PVB. Soyuz TM-31 - . Call Sign: Uran. Crew: Gidzenko, Krikalyov, Shepherd. Payload: Soyuz TM s/n 205. Mass: 7,250 kg (15,980 lb). Nation: Russia. Related Persons: Gidzenko, Krikalyov, Shepherd. Agency: RAKA. Manufacturer: Korolev bureau. Program: ISS. Class: Manned. Type: Manned spacecraft. Flight: Soyuz TM-31. Spacecraft Bus: Soyuz. Spacecraft: Soyuz TM. Duration: 186.91 days. Decay Date: 2001-05-06 . USAF Sat Cat: 26603 . COSPAR: 2000-070A. Apogee: 385 km (239 mi). Perigee: 378 km (234 mi). Inclination: 51.50 deg. Period: 92.18 min. Soyuz TM-31 delivered the Expedition One crew to the International Space Station with Gidzenko as the Soyuz crew commander with the call-sign 'Uran'. The spacecraft docked at Zvezda's rear port at 0921 GMT on November 2. The hatch to Zvezda was opened at 1023 GMT. Once aboard ISS, Shepherd became the ISS Commander, with 'Station Alpha' as the ISS callsign. Soyuz TM-31, with Shepherd, Gidzenko and Krikalyov aboard, undocked from the -Y port on Zvezda on February 24, 2001 at 1006 GMT and redocked with the -Z port on Zarya at 1037 GMT. This freed the Zvezda port for a Progress resupply ship. After the departure of the Progress, Soyuz TM-31 undocked from the Zarya nadir port April 18 2001 at 1240 GMT and redocked with the Zvezda aft port at 1301 GMT, leaving clearance for the Raffaello MPLM module to be berthed at the Unity nadir during the STS-100 mission. 2000 November 1 - . ISS Status Report: ISS 00-46 - . Nation: USA. Related Persons: Fuglesang, Gidzenko, Shepherd. Program: ISS. Flight: Soyuz TM-31. ISS Status Report: ISS 00-47 - . Nation: USA. Related Persons: Gidzenko, Shepherd. Program: ISS. Flight: Soyuz TM-31. 2000 November 2 - . ISS Status Report: ISS 00-48 - . Nation: USA. Related Persons: Gidzenko, Shepherd. Program: ISS. Flight: Soyuz TM-31. 2000 November 3 - . 2000 November 4 - . ISS Status Report: ISS 00-50 - . Nation: USA. Related Persons: Gidzenko, Shepherd. Program: ISS. Flight: Soyuz TM-31. 2000 November 6 - . 2000 November 9 - . 2000 November 10 - . 2000 November 14 - . 2000 November 15 - . 2000 November 17 - . 2000 November 22 - . ISS Status Report: ISS 00-59 - . Nation: USA. Related Persons: Gidzenko, Shepherd. Program: ISS. Flight: Soyuz TM-31. 2000 December 14 - . ISS Status Report: ISS 00-61 - . Nation: USA. Related Persons: Gidzenko, Shepherd. Program: ISS. Flight: Soyuz TM-31. 2000 December 20 - . ISS Status Report: ISS 00-62 - . Nation: USA. Related Persons: Gidzenko, Shepherd. Program: ISS. Flight: Soyuz TM-31. 2000 December 26 - . ISS Status Report: ISS 00-63 - . Nation: USA. Related Persons: Gidzenko, Shepherd. Program: ISS. Flight: Soyuz TM-31. 2000 December 31 - . 2001 January 25 - . ISS Status Report: ISS 01-04 - . Nation: USA. Related Persons: Gidzenko, Shepherd. Program: ISS. Flight: Soyuz TM-31. 2001 February 24 - . ISS Status Report: ISS 01-06 - . Nation: USA. Related Persons: Gidzenko, Shepherd. Program: ISS. Flight: Soyuz TM-31. 2001 February 28 - . ISS Status Report: ISS 01-07 - . Nation: USA. Related Persons: Gidzenko, Helms, Shepherd, Voss. Program: ISS. Flight: Soyuz TM-31. 2001 March 8 - . 2001 March 9 - . STS-102 Mission Status Report #03 - . Nation: USA. Related Persons: Gidzenko, Helms, Kelly, James, Richards, Paul, Shepherd, Thomas, Andrew, Voss, Wetherbee. Program: ISS. Flight: Soyuz TM-31, STS-102, STS-102 ISS EO-2. 2001 March 10 - . STS-102 Mission Status Report #06 - . Nation: USA. Related Persons: Gidzenko, Helms, Richards, Paul, Shepherd, Thomas, Andrew, Voss. Program: ISS. Flight: Soyuz TM-31, STS-102, STS-102 ISS EO-2. 2001 March 13 - . STS-102 Mission Status Report #12 - . Nation: USA. Related Persons: Gidzenko, Helms, Shepherd, Voss, Wetherbee. Program: ISS. Flight: Soyuz TM-31, STS-102, STS-102 ISS EO-2. 2001 March 14 - . 2001 March 16 - . STS-102 Mission Status Report #18 - . Nation: USA. Related Persons: Gidzenko, Kelly, James, Richards, Paul, Thomas, Andrew, Wetherbee. Program: ISS. Flight: Soyuz TM-31, STS-102, STS-102 ISS EO-2. 2001 March 17 - . 2001 March 18 - . STS-102 Mission Status Report #22 - . Nation: USA. Related Persons: Gidzenko, Helms, Kelly, James, Shepherd, Voss, Wetherbee. Program: ISS. Flight: Soyuz TM-31, STS-102, STS-102 ISS EO-2. STS-102 Mission Status Report #21 - . Nation: USA. Related Persons: Gidzenko, Kelly, James, Richards, Paul, Shepherd, Thomas, Andrew, Voss, Wetherbee. Program: ISS. Flight: Soyuz TM-31, STS-102, STS-102 ISS EO-2. 2001 March 19 - . 2001 March 21 - . Landing of STS-102 - . Return Crew: Gidzenko, Kelly, James, Krikalyov, Richards, Paul, Shepherd, Thomas, Andrew, Wetherbee. Nation: USA. Related Persons: Gidzenko, Kelly, James, Krikalyov, Richards, Paul, Shepherd, Thomas, Andrew, Wetherbee. Program: ISS. Flight: Soyuz TM-31, STS-102. STS-102 landed at 07:31 GMT with the crew of Wetherbee, Kelly, Thomas Andrew, Richards Paul, Gidzenko, Krikalyov and Shepherd aboard..
2001 May 6 - . Landing of Soyuz TM-31 - . Return Crew: Gidzenko, Krikalyov, Shepherd. Nation: Russia. Related Persons: Gidzenko, Krikalyov, Shepherd. Program: ISS. Flight: Soyuz TM-32 ISS EP-1. On April 30 the crew of Soyuz TM-32 (Afanasyev, Kozeyev, Andre-Deshays) transferred their customized reentry seat liners to Soyuz TM-31, at which point TM-32 became the Station's rescue vehicle. After a six day stay, they undocked Soyuz TM-31 from Zvezda's -Y port at 02:21 GMT on May 6. The deorbit burn came at 04:47 GMT, with landing near Arkalyk in Kazakhstan at 05:41 GMT on May 6. 2002 April 25 - . 06:26 GMT - . Launch Site: Baikonur. Launch Complex: Baikonur LC1. LV Family: R-7. Launch Vehicle: Soyuz-U-PVB. Soyuz TM-34 - . Call Sign: Uran. Crew: Gidzenko, Shuttleworth, Vittori. Payload: Soyuz TM s/n 208. Mass: 6,750 kg (14,880 lb). Nation: Russia. Related Persons: Gidzenko, Shuttleworth, Vittori. Agency: RAKA. Manufacturer: Korolev bureau. Program: ISS. Class: Manned. Type: Manned spacecraft. Flight: Soyuz TM-34 ISS EP-3. Spacecraft Bus: Soyuz. Spacecraft: Soyuz TM. Duration: 198.73 days. Decay Date: 2002-11-10 . USAF Sat Cat: 27416 . COSPAR: 2002-020A. Apogee: 397 km (246 mi). Perigee: 387 km (240 mi). Inclination: 51.60 deg. Period: 92.40 min. Launch delayed from April 10, 22 and 17. Soyuz TM-34 was launched on ISS Mission 4S with Commander Yuri Gidzenko of Rosaviakosmos, Flight Engineer is Roberto Vittori of ESA, and Tourist Mark Shuttleworth, a South African citizen. At 1210 UTC Soyuz TM-34 was in a 242 x 269 km x 51.6 deg orbit. The flight was also referred to as ISS Mission 4S, the EP-3 visiting crew flight, and even as 'Soyuz 4' by NASA. Soyuz TM-34 docked with the nadir port on the Zarya module at 0755 UTC on April 27. The 4S flight docked at the Zarya nadir port on April 27. and the crew would return to Earth in the old TM-33 vehicle, leaving TM-34 as the active ISS rescue vehicle. 2002 May 5 - . Landing of Soyuz TM-33 - . Return Crew: Gidzenko, Shuttleworth, Vittori. Nation: Russia. Related Persons: Gidzenko, Shuttleworth, Vittori. Program: ISS. Flight: Soyuz TM-34 ISS EP-3. On May 5, 2002, after a week aboard the station, the visting Soyuz TM-34 crew of Gidzenko, Vittori and Shuttleworth moved to the old Soyuz TM-33, docked at the Pirs port. They undocked at 0031:08 UTC on May 5, leaving the EO-4 crew of Onufrienko, Walz and Bursch with the new Soyuz TM-34 as their rescue vehicle. Soyuz TM-33 made its deorbit burn at 0257 UTC and landed successfully at 0352 UTC 25 km SE of Arkalyk.